* Please Note: Mortar for adhesion and brick joints must be purchase separately. Finish the interior of your Stone Age Manufacturing Fireplace in style with this firebrick kit. 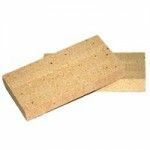 The Stone Age Manufacturing Firebrick Kit - FIREBRICK-110-FULL kit will give your fireplace an authentic masonry fireplace appearance without any of the guesswork on how many bricks you need. Each brick measures at 9 inches long, 4 1/2 inches wide, and 2 1/4 inches high. However, please be aware that mortar is sold separately. So make sure to give your Stone Age fireplace the finish touch it deserves with this great kit.